Wahl Tea Tree Shampoo is a carefully balanced formula that has been designed to gently comfort the skin as it cleans and de-greases the coat. Made using natural ingredients including coconut oil, wheatgerm oil and peppermint oil, Wahl Tea Tree Shampoo also includes tea tree oil that has been widely used for years for its soothing, cooling and antibacterial properties. Wahl Tea Tree Shampoo also contains ingredients that will rejuvenate the hair as it cleans, promoting healthy, glossy results every time. 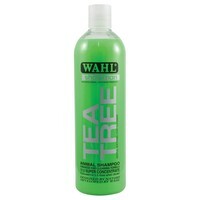 Please Note: Wahl Tea Tree Shampoo is a concentrated formula that will need diluting before use.